The leaves are changing and the weather is getting cooler, it is officially fall. Celebrating the season, I am drinking a pumpkin spice latte and starting to bundle up but before I get too far into unpacking my scarves, I will take a moment to look back on the warmer times. Summer is spent with days on the beach and if you’re lucky enough to live in Milwaukee, great nights at Summerfest seeing your favorite bands. My favorite Summerfest show that I have been reminiscing about lately would definitely have to be seeing Jacks Mannequin the summer of 2007. The show was at the U.S. Cellular Connection Stage that is sponsored by Leinenkugel’s and FM 102.1 and took place on the 4th of July. This show was such a great show because it took place on the best day of the year, my birthday! The band played at 10:00 PM and the weather was perfect, a cool breeze coming in off Lake Michigan and I went with all of my friends. 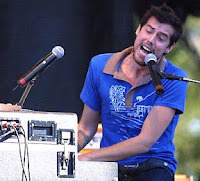 The band put on an awesome show and front man and pianist Andrew McMahon shared a great moment with the fans as it was the last day he took pills for his chemotherapy to treat leukemia. The band played some awesome songs from their debut CD , Everything In Transit and some new tracks from The Glass Passenger, their most recent CD. For many reasons, this is my favorite show from my vault of Summerfest memories. July 3rd is the best day to go to Summerfest. Fireworks and Beer go so well together.